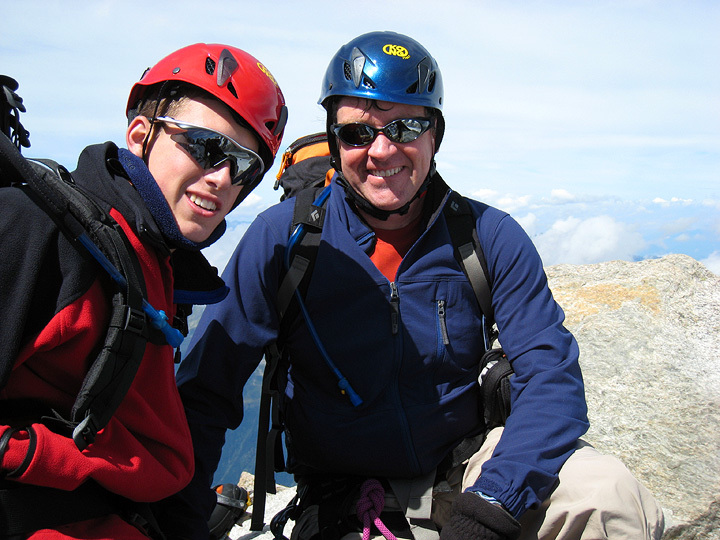 Coming from their home in Virginia, Bruce Beaman, and son Mike joined Mark for 4 days of climbing in the Chamonix area. Also with them, though staying off the steeper stuff, was Bruce's wife Cindy. 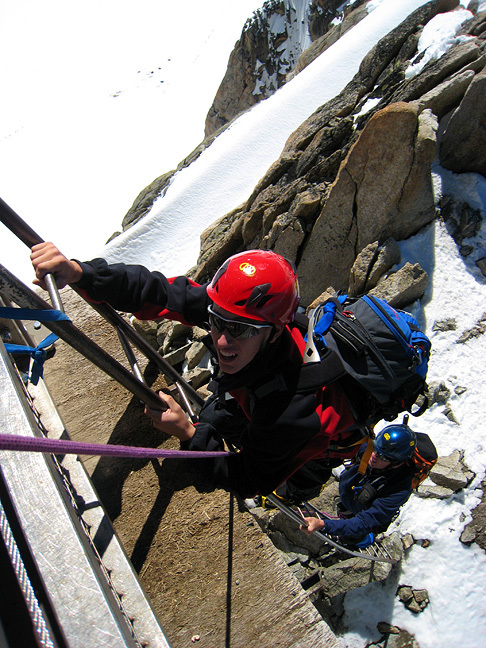 Cindy did join us for the ascents of the Aiguille du Midi (cable car route) as well as on the the Grand Montets. Early August has had some tumultuous weather, but with adjustments to our itinerary we were able to put the one really bad day to good use with an approach to a hut. 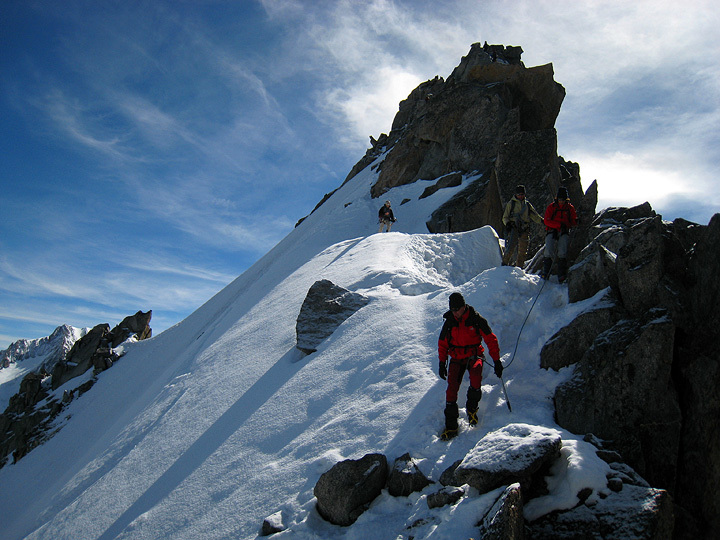 For our first climb we did the Petite Aiguille Verte. 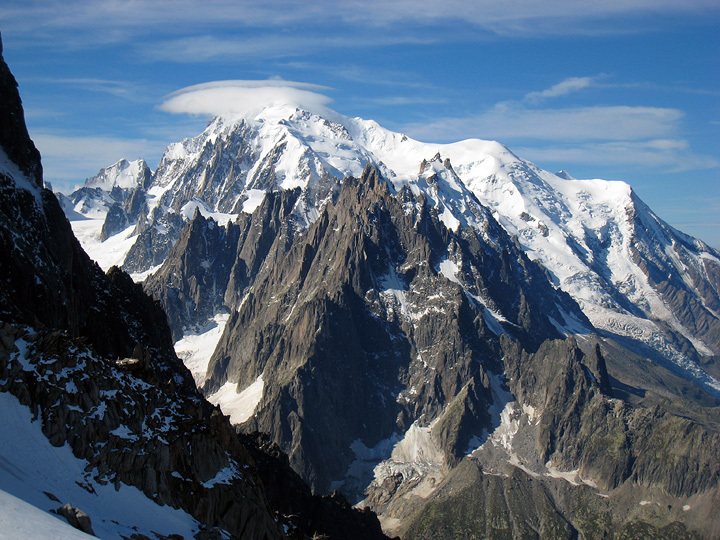 This view of Mont Blanc is from the top of the Grands Montets cable car lift. 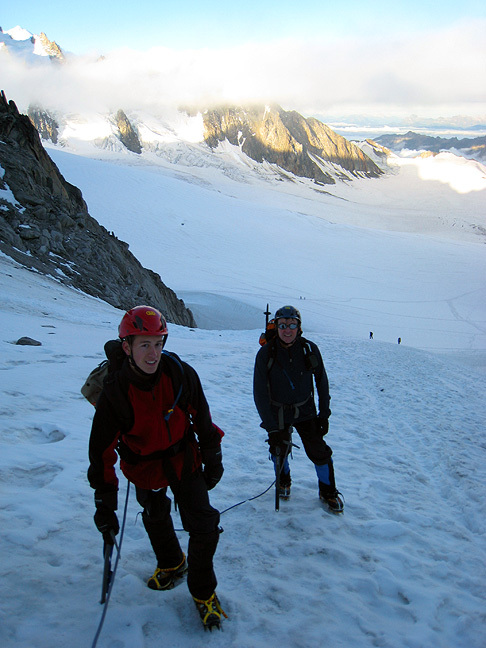 The Petite Aiguille Verte is a fun route, with a bit of easy glacier, then a rock and snow ridge to the summit. With a bit of rain the previous night, and cool temperatures, the peak picked up a trace of new snow, necessitating the use of crampons all the way to the top. 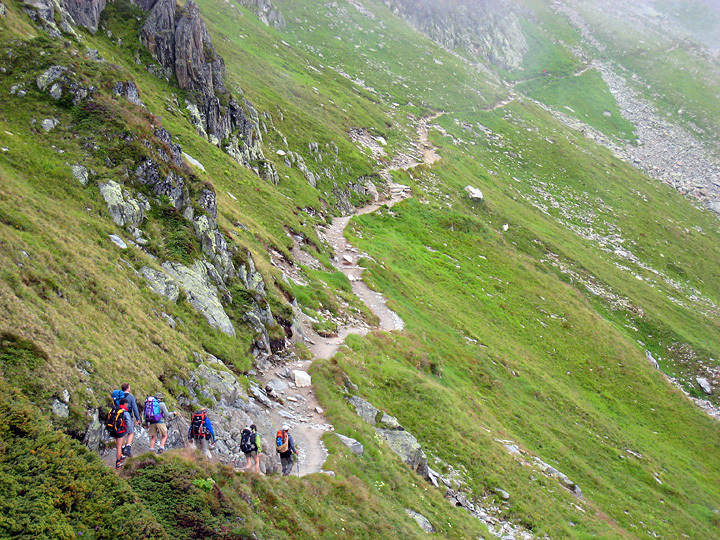 In this photo, another party in descent passes us as we head up. 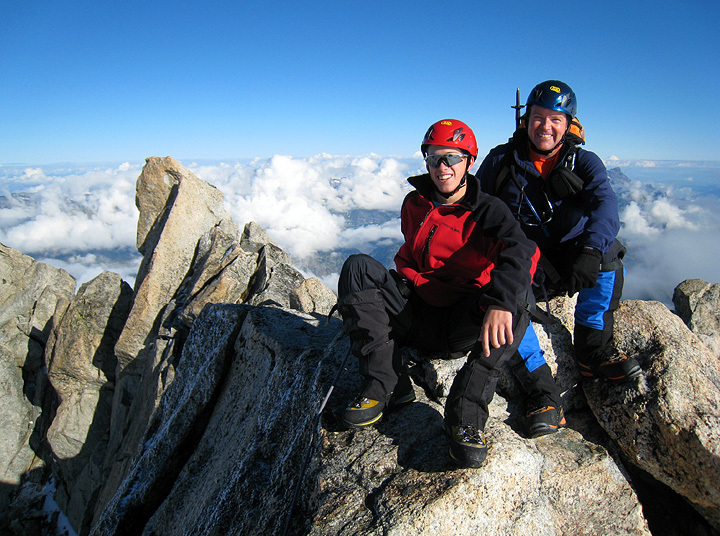 Mike and Bruce on the summit of the Petite Verte. 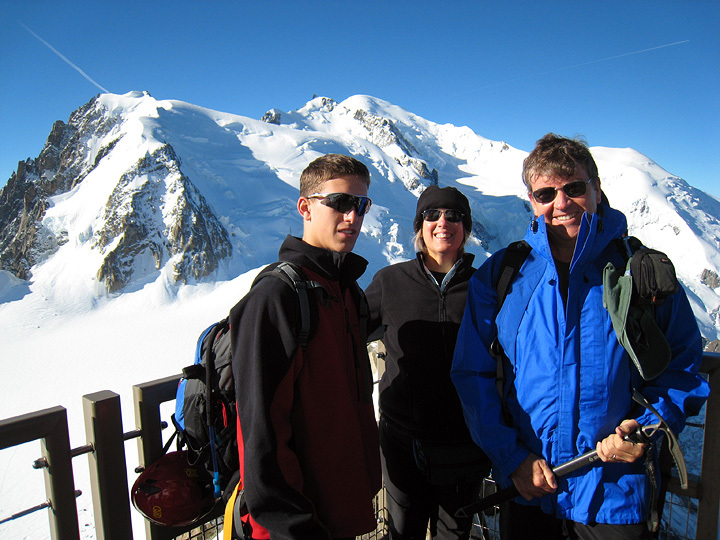 Mike, Cindy and Bruce on the summit of our next objective, the Aiguille d Midi. 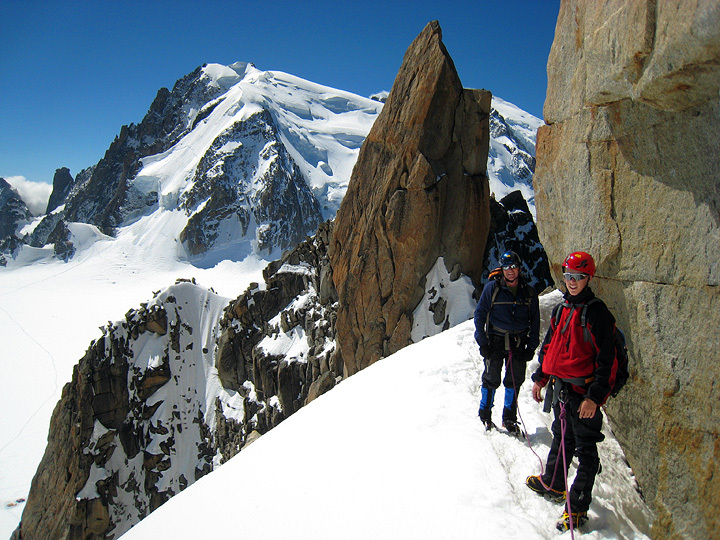 While Cindy did both the Midi and the Brévent in one day, Bruce, Mike and Mark had to content themselves with only the Arête des Cosmiques on the Midi. The view east from the Midi. 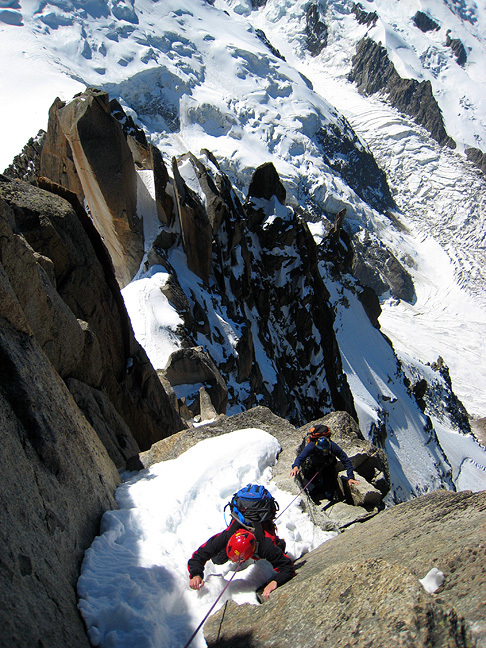 The "approach" arête, taken in descent. 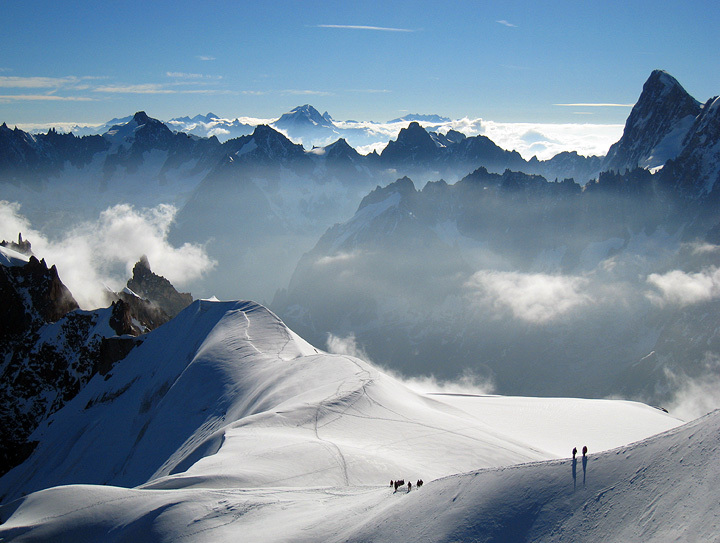 The big peaks of the Swiss Valais in the distance, Weisshorn, Dent Blanche, Grand Combin, Matterhorn and the Monte Rosa summits. 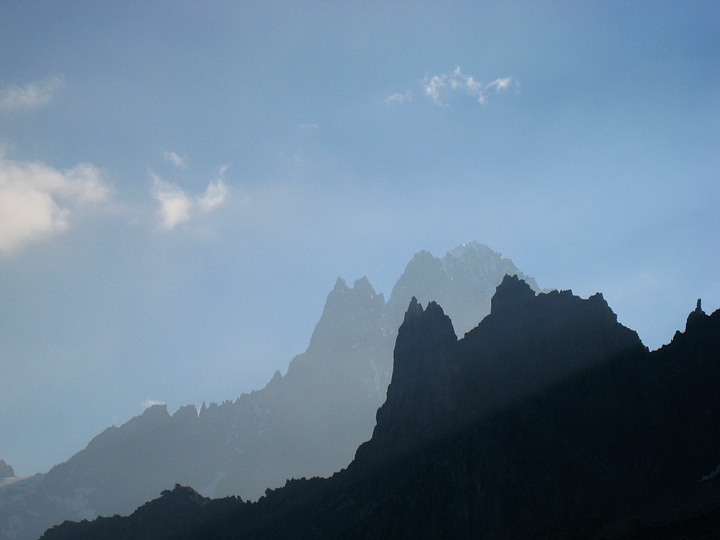 The Aiguille de l'M (front) and the Aiguille Verte as seen from the cable car ride up to the Midi. 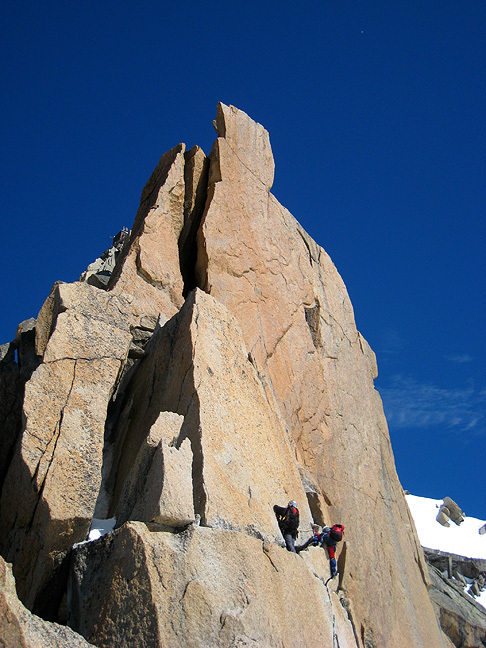 Another view of the "approach" arête on the Midi. ...followed soon by the crux wall. Looking down the last 60 feet, or so, of the route. And the final ladder pitch to the Midi observation deck. 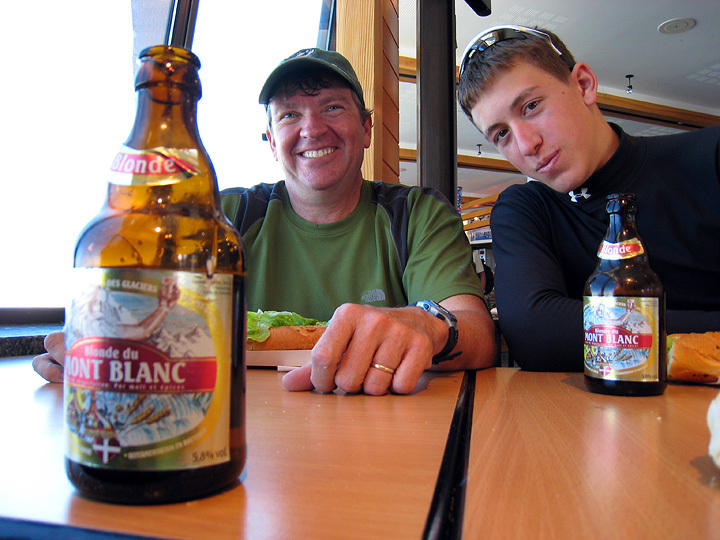 In no rush to descend to Chamonix, Bruce and Mike sample the local "Blonde du Mont Blanc" at one of the several restaurants tunneled into the summit of the Midi. With poor weather forecast for the next day, we spent the latter part of it approaching the Albert Premier hut. The next morning the weather was better, if still a bit cloudy. 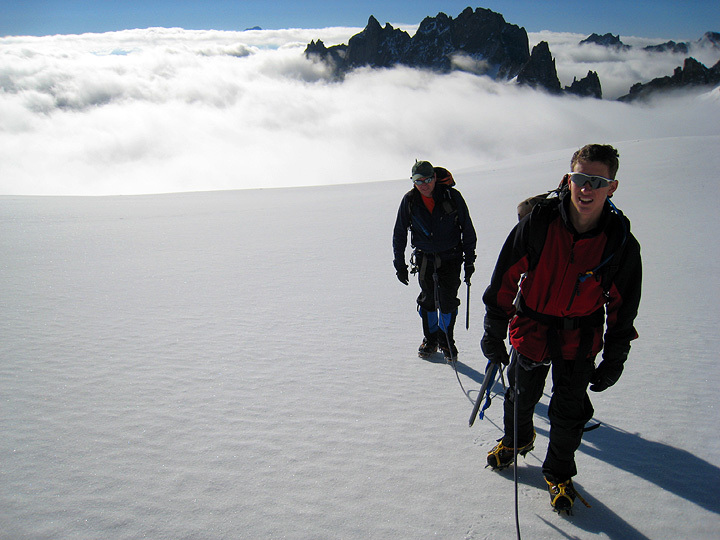 Here we head up towards the Aiguille du Tour. 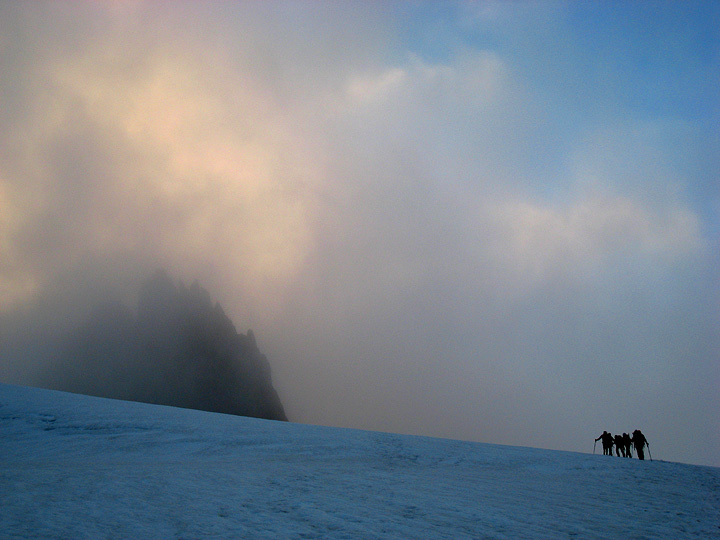 Another group of climbers as the morning clouds begin to dissipate. Almost to the Col Superior du Tour. 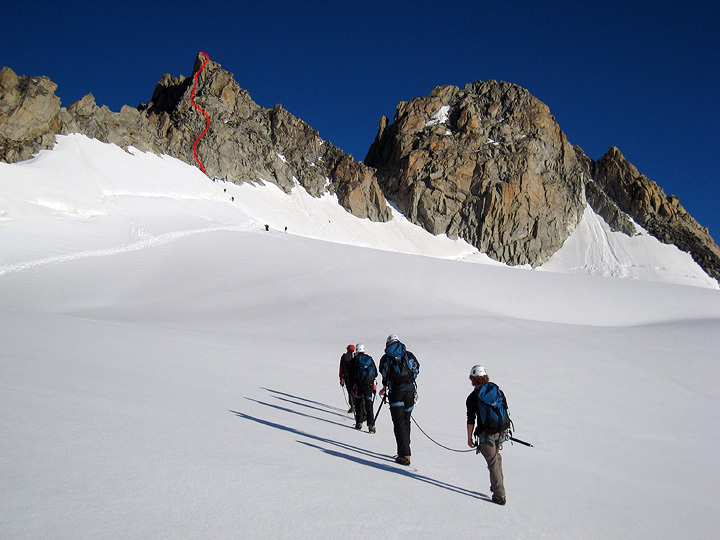 And into the sun on the Plateau du Trient. 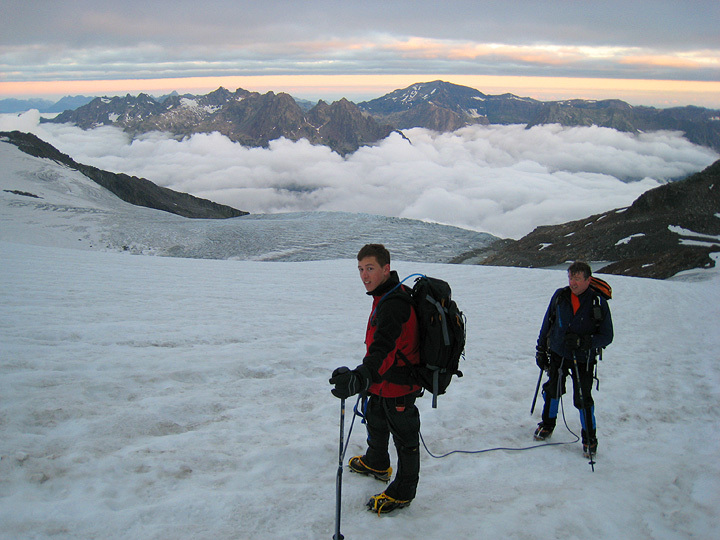 Climbing on perfect frozen snow above a seas of cloud. 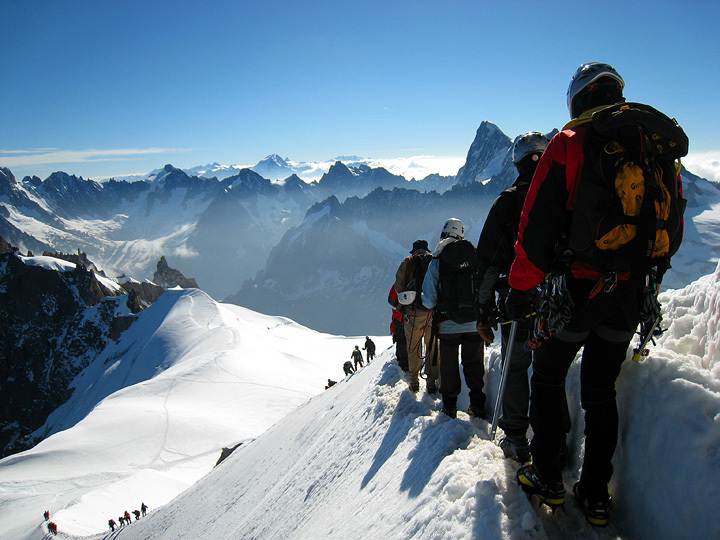 Another party approaches the Aiguille du Tour. Our route marked in red. 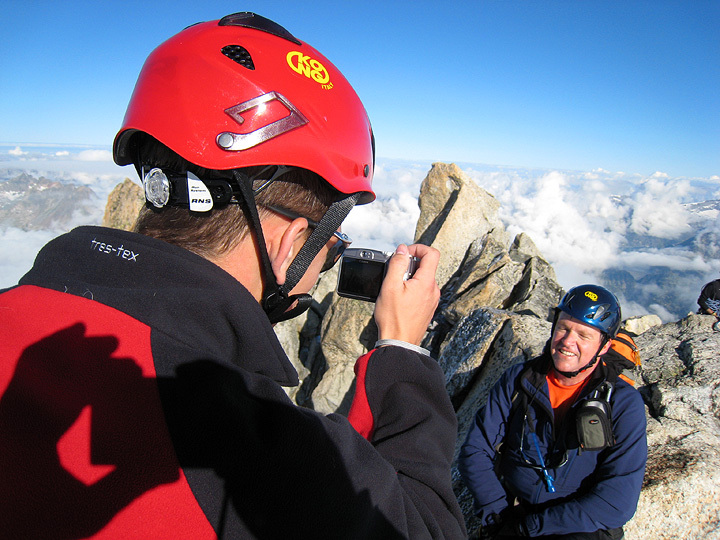 Working on those summit photos. And the results.... 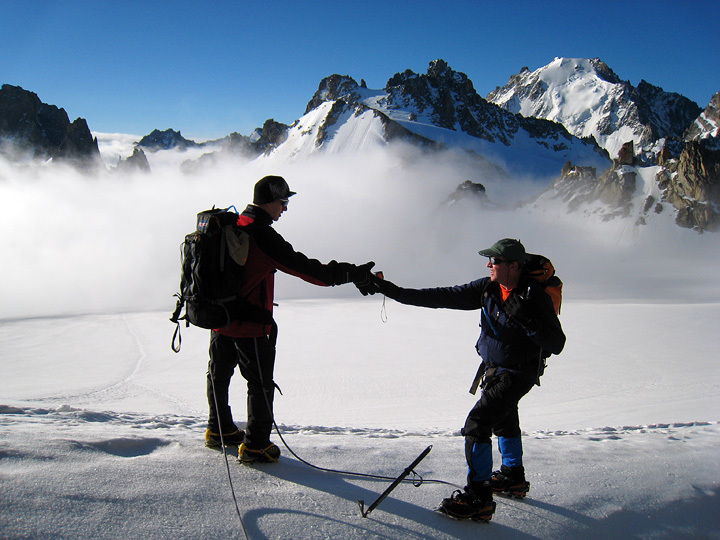 The summit of the Aiguille du Tour. 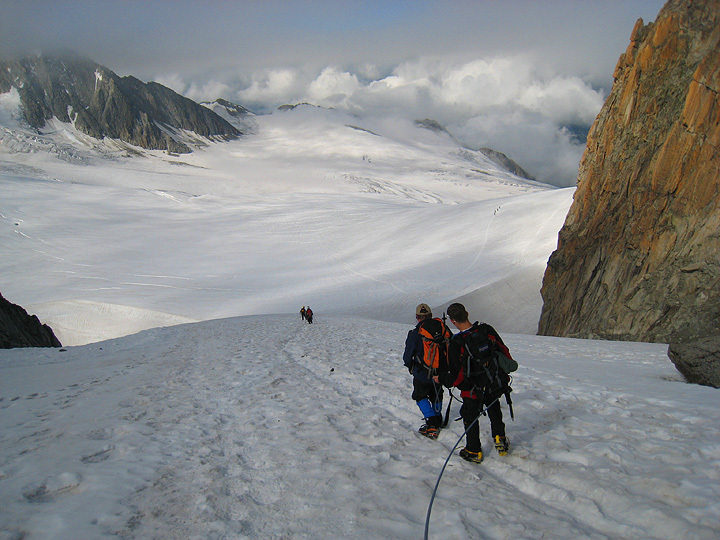 Descending back to the Albert Premier hut on the Glacier du Tour. And the final "steps" back to civilization. 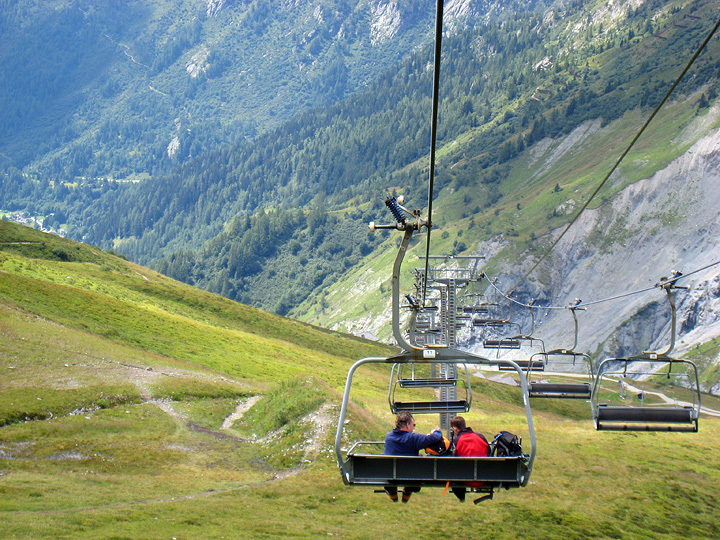 Riding the chair down from the Col du Balme.